Fortune teller GoldxCross BR saw our submitter’s recent entry on XBL Gamer Spotlight and was overtaken by a terrifying vision. Categories: Jealous, much?, Unprovoked Rage, Wait, what? Geez. ”Jealous, much?” is right. It’s hard for me to believe that people can be so small, petty and angry that they read up on the gamer spotlight just to have a target to lash out upon. Lol! Oh I love the internet. I honestly don’t understand why they continue with the gamer spotlight. I thought I knew what I was getting into, but it’s like “Hooray, you’re honored with the spotlight! As a prize, you get the laser like focus of every petty angry XBL user, along with those who are stupid and lack reading comprehension, for one whole week!” I hope it’s not off topic to share my experiences here even if I’m not female. Mutantlog, this website is for anyone who gets harassed, not just women. Sorry you got crap for being in the Gamer Spotlight. Wow. Just wow. U mad bro? Did….did he mistake “phd” for “std”? Geez, the volume of bile you got is ridiculous. Thanks for posting it. It is ridiculous, both in the bile, and the useless requests. There was nothing of interest to post, but I had a crazy number of friend requests with no message as well. I did my best to stay on top of it while away from the Xbox, so I could keep the offensive ones and file complaints on them when I was at home. “Bowflex really needs to work on their viral marketing” HA! That is easily my favorite of the ones I’ve read…god, awesome contribution to the entertaining stuff on the net. You’re a scholar and a gentleman for detailing your suffering for our enjoyment. 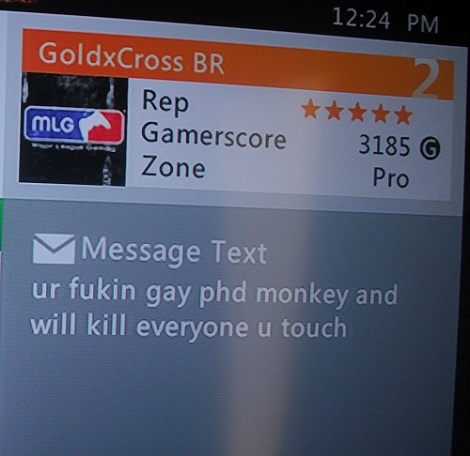 Dr. Monkey, Gay Monkey, Phd. at your service.